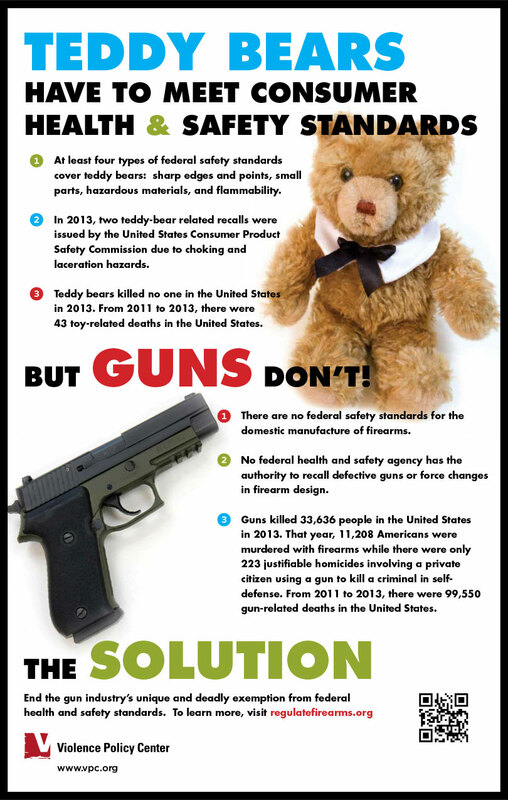 Did you know that teddy bears have to meet federal health and safety standards, but guns don’t? Learn more, and download the poster now! Guns are the only consumer products manufactured in the United States that are not subject to federal health and safety regulation. All other products that Americans use or come into contact with are regulated by a federal health and safety agency. The Consumer Product Safety Commission (CPSC) regulates household and recreational products such as toasters, lawn mowers, and toys. The Food and Drug Administration (FDA) oversees the safety of food and prescription drugs. The National Highway Traffic Safety Administration (NHTSA) regulates motor vehicles. Thanks to the political clout of the gun lobby, firearms escaped safety regulation in the 1970s when the U.S. Congress created the major product safety agencies. This unique exemption has allowed gunmakers to innovate for lethality rather than safety. As a result, today’s gun industry thrives on developing, manufacturing, and marketing highly militarized firearms including high-capacity pistols, assault weapons, and 50 caliber sniper rifles. Guns killed more than 38,000 Americans in 2016. We can stop this epidemic of gun violence: regulate firearms to reduce death and injury and protect public health, just as we do for all other consumer products. Did you know that states with higher rates of gun ownership and weaker gun laws lead the nation in gun deaths, while states with lower rates of gun ownership and tougher gun laws have the lowest rates of gun death? In 2016, the five states with the highest per capita gun death rates were Alaska, Alabama, Louisiana, Mississippi, and Oklahoma. In contrast, ranking last in the nation for gun death was Massachusetts, followed by New York, Hawaii, Rhode Island, and Connecticut. Learn more. Did you know that household gun ownership in the United States has plummeted since the 1970s? In 1977, 54 percent of American households had a gun in them. By 2014, this percentage had dropped to 32 percent. Learn more. Did you know that in the wake of declining gun ownership, the gun industry has focused on the development and marketing of military style firearms to appeal to a shrinking core market of white males? Learn more. Did you know that most gun deaths are suicides, not homicides? Of the more than 38,000 gun deaths that occurred in 2016, 22,938 were suicides. The success of any suicide attempt depends primarily on the lethality of the means employed – and guns are the most lethal means available. Learn more. Did you know that homicide, usually involving a gun, is the leading cause of death for black teens and young adults ages 15 to 24? Learn more. Did you know that 91 percent of murder-suicides involve a gun, almost always involve a male killing his spouse or family, and four out of five times occur in the home? Learn more.